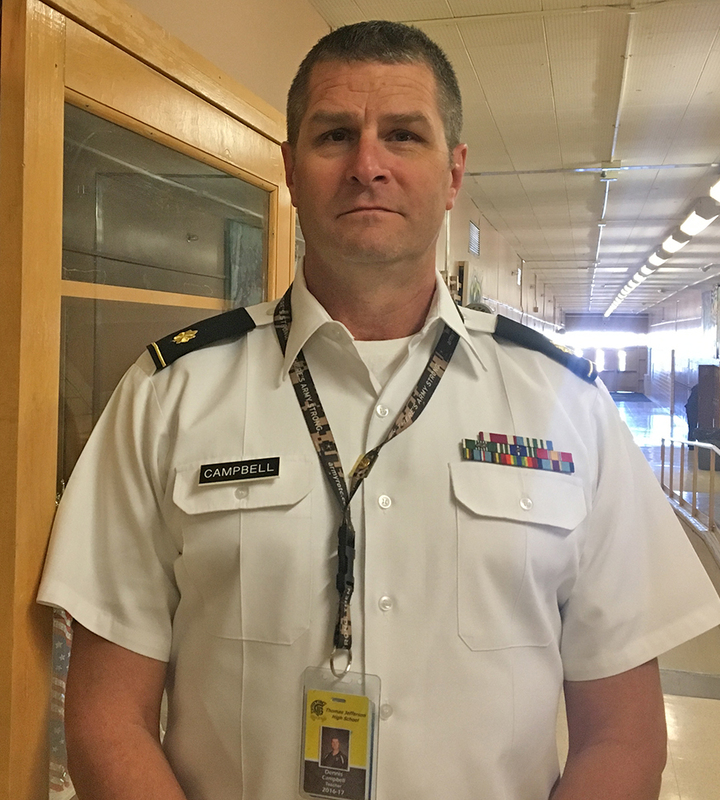 Major Dennis Campbell has been providing instruction in military science and serving as the Senior Army Instructor at Thomas Jefferson HS in the Junior Reserve Officer Training Corp (JROTC) for five years – and within DPS for almost a dozen years. But his enthusiasm for the work and his love of students is as strong as it was the first day he stepped into the role. A 22-year Army and Marine Corp veteran, Dennis enjoys instilling in his students the same love of service and dedication to country that he has held throughout his adult life. Over the course of his career MAJ Campbell has been assigned to numerous duty stations, including Fort Benning in Georgia, Fort Ord in California, Fort Huachuca in Arizona, Camp Casey in Korea, Pearl Harbor in Hawaii and others. He also deployed numerous times overseas in support of military missions including Operation Just Cause in Panama, Honduras and other regions of the world. In all, Dennis and his wife estimate they have lived in more than 30 homes throughout his career. With so much of society focused on selfish interests, Dennis is proud that his students look beyond monetary and personal gain and focus on giving back through hard work and self sacrifice. Dennis works everyday to help students learn this valuable lesson – and he sees the promise of a better future in the eyes of every one of his students. “I think as a nation we have to, at some point reexamine the whole way we educate and re-evaluate what success looks like in that education,” he said.